Will the person nearest my Elly at this moment, give her the Kiss-of-Life and drag her up off the floor! I can do nothing these days because she worries about me so much. Well then I will begin. Following a Power cut on a Monday the other week I have experienced fluctuation with the light levels every evening. At first I thought it was my eyes. The lights dimmed but did not go out. After about an hour or sometimes two they went back to normal. Now I am not a heavy user of electricity. Lights in the living room were on as were the computer & the radio. My oil fired central heating was pumping away and the place was warm. The fridge/freezer was working normally and several clocks through the house were showing the correct time. The only problem was with the lights. This continued to happen three nights in a row. A little worried that the power might be cut again I decided to phone my provider NIE (Northern Ireland Electricity) on the Thursday evening. I spoke to a very nice young lady and she seemed rather puzzled by my query. She was aware of the break in power on the Monday and said she would pass the message on to the engineers so that they could check things out the next day. She told me that NIE offers a critical care information service to customers who have health issues or are dependent on life supporting electrical equipment. 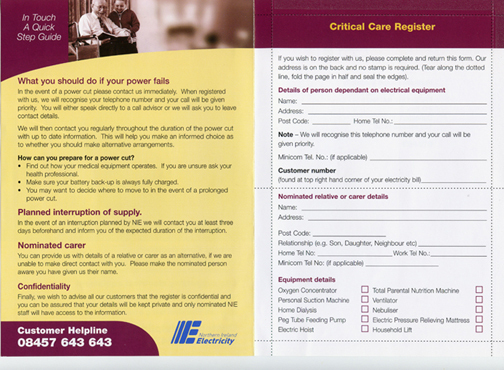 Once registered with NIE they can provide up to date information during a power cut or a planned interruption. If I need to call them my number would be recognised and I would be given priority. I never realised this service was available. Did You? So if you live in Norn Iron and know of anyone in any of the situations listed above then tell them to call NIE. If you live anywhere else in the wider world, check out your electricity provider. Who knows when you might need the service I hope you never do. This entry was posted in Health on December 7, 2007 by Grannymar.